We look forward to seeing you at the Festival in May! The programme of walks provides the opportunity to be led by local experts to learn something new about the history and landscape. Easy Boot 1: Low level routes without any steep climbs, taken at a relaxed pace and suitable for novice walkers. Wear comfortable clothes that enable you to move freely. Flat shoes or boots with grip on the soles should be worn. Remember that the ground may be wet, muddy and uneven. Moderate Boot 2: There may be some short sections of steep ground, but if there are, these will be taken at a gentle pace. Could be on the open hill. Energetic Boot 3: Walks generally involve one or two steep climbs. 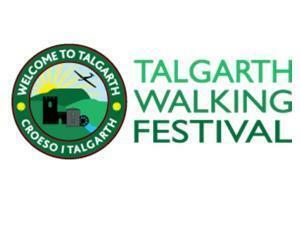 These walks are suitable for people who can manage distance but not too many ascents/descents. Strenuous Boot 4: Walks require fitness and stamina to cope with several steep climbs on the open hills and will cover a long distance at a steady pace. Cost of the walks varies from £3.00 to £11.00. From Hereford - A438 to Bronllys/A479; From Abergavenny - A40/A479; From Builth Wells - A470 to Bronllys/A479.